Just arrived and ready for shipping–the new Winter 2007/Spring 2008 catalog of BMH Books products! This 20-page full-color catalog includes the more than 120 products available from BMH Books in Winona Lake, Indiana. Special features of this new edition include a full index by title and by author, and the addition of more than a dozen new products since the last catalog. 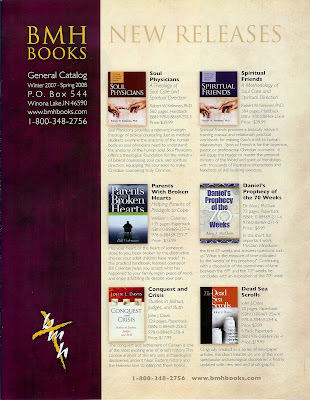 Church staffs and librarians are encouraged to order, without charge, as many catalogs as they can use. Call BMH Books at 1-800-348-2756 for your supply today. All BMH Books products are also on display and available for purchase by credit card by logging onto http://www.bmhbooks.com/.